Andrea Mazzega talks about the history of the company. AV Mazzega – http://www.avmazzega.com – website offline since 2018The Facebook page of AV Mazzega is gone since November 2017. Mazzega 1946 is the new name of the company. Materials: Metal (iron) chrome frame and 9 amber and clear crystal glass hand blown Murano ‘ice’ blocks. Bakelite sockets. Chromed iron chain. Any type of light bulb can be used, not a specific one preferred. 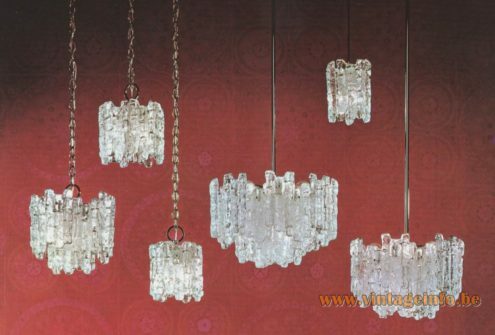 But clear light bulbs gives the best result with this type of chandeliers. Designer: Carlo Nason – attributed. Manufacturer: AV Mazzega, Murano, Italy. Other versions: Also made as ceiling lamp, wall lamp and floor lamp. Bigger and smaller versions were also produced. Similar chandeliers, models Sierra and Fuego, were produced by AV Mazzega for J.T. Kalmar KG, Franken KG from Austria. 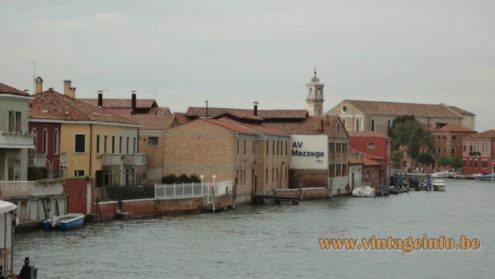 AV Mazzega was founded in 1946 by Angelo Vittorio Mazzega. In 1950 his son Gianni Bruno Mazzega started working in the family’s glass factory. Gianni Bruno Mazzega is responsible for the creation of many beautiful lamps. Today, under the watchful eye of Andrea Mazzega, grandson of Angelo Vittorio, the company works together with high-level international designers. Andrea is the president of the company since 2000. Today the company is named Mazzega 1946. Designers that worked for AV Mazzega – Mazzega 1946 are among others: Carlo Nason, Aldo Nason, Christophe Pillet, Michele De Lucchi, Giovanni Barbato, Paolo Piva, Sam Baron, Gasmi Chafik, Oriano Favaretto and Riccardo Giovanetti. Born in Murano in 1935 he grew up in one of the oldest families of Murano glass makers where experts introduced him to the most refined techniques. In the 60s he worked for the family glass works Nason & C.
He quickly started to collaborate with other glass workshops, with special attention for modern design and achieving a combination of technique and craftsmanship which characterizes all his projects. Carlo has always shown an attitude for innovation without loosing his tradition. From 1965 until 1980 he designed the complete collection of AV Mazzega, that today is an icon of vintage: the creation of the highest quality at the level of its design. Carlo Nason designed for De Majo, Leucos, Alt Lucialternative, Gallery Vetri D`Arte, Murano Due, Vetreria Vistosi, Vetreria Carlo Moretti, Vetreria Livio Seguso, Gruppo Firme di Vetro di Salzano and several other companies. Not only he designed glass objects, he designed ceramics for Baldelli, ski shoes for Garmont; consultant for Casinos Austria International in Vienna and worked on graphics for several companies. In 1975 he founded his own company iTRE. Since 2002 the company is owned by FDV Group S.p.A., better known as LEUCOS. Many well known designers worked for the iTRE company. Not only is he a designer, He is also passionate about photography, in the 60s and 70s he has won numerous competitions. Carlo’s work can be found in several museums. The Museum of Modern Art MoMA in New York, USA, the Triennale Design Museum in Milan, Italy. The Corning Museum of Glass in New York has a large collection of his works.